DO YOU WANT US TO COME TO YOUR PLACE? If you can provide a hall or class room in your school/ college, our director Mr.Rajan comes and conducts seminars in your institution! Charges according to the number of sessions and students! 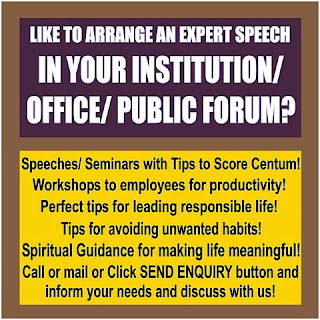 We offer perfect tips to score centum, such as how to read, revise, write the exams, etc and tips to encourage the students in avoiding diversions and clear the psychological barriers in their learning process! 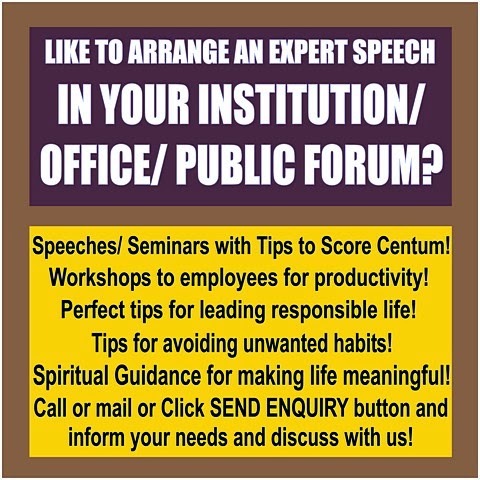 The efficiency of your work force will increase when we boost their morale by giving perfect tips to balance their personal life and career and also to know the needs to work efficiently. Contact us for a schedule. We give seminars for a group of employees numbering from even a few to 100s. Call 96 88 33 22 33 or 93451 55444 for customized advice for you and our charges. Or, send your Name, Clear address, Mobile No. & purpose of contacting, as SMS to above numbers or mail us to director@starwin.in. We will send the details by courier. Just try once and see the result!